The South Korean government should specifically use the proposed extra fiscal spending to bolster waning potential growth in Asia’s fourth largest economy and ready a roadmap to raise tax revenue base to sustain the fast-aging society, said a senior official of the International Monetary Fund (IMF). “Korea should keep up expansion in fiscal policy, and a supplementary budget should go to raising potential growth rate,” Rhee Changyong, IMF’s Asia and Pacific department director, told the Maeil Business Newspaper in an exclusive interview. The IMF did not follow others to downgrade growth outlook for the Korean economy and maintained its forecast for Korea’s annualized growth at 2.6 percent for this year, while cutting estimate for global growth to 3.3 percent from 3.5 percent, by counting in proposed extra spending, he said. The IMF after annual review earlier this year advised Seoul to increase budget in order for the economy to achieve the government growth target of 2.6 percent to 2.7 percent. Korea’s potential growth rate is estimated to have fallen below 3 percent as the economy has been mired in the 2 percent growth range over the last decade. 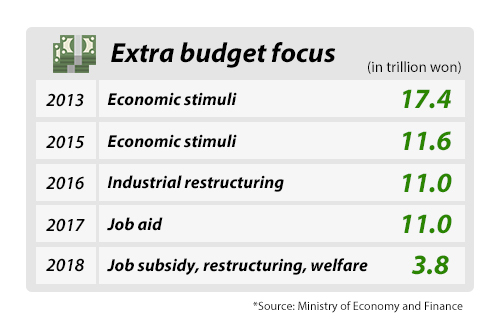 The Korean government plans to propose an extraordinary budget of near 7 trillion won ($6.2 billion) on top of supersized 2019 budget of 469.6 trillion won. The proposal may face a contest in the legislative as the opposition has been questioning the efficacy of heavy fiscal spending over the last two years that mostly went to service the liberal government’s income-led growth policy comprising of jump in minimum wage, cutback in working hours, and welfare subsidies. Rhee also advised rationalization in the tax code to bolster public finance amid decreased fiscal ammunitions against increasing welfare cost. “The Korean government would see its budget deplete quickly in about ten years as its population is fast aging, and it should create a sustainable fiscal structure by gradually increasing taxes,” he said. 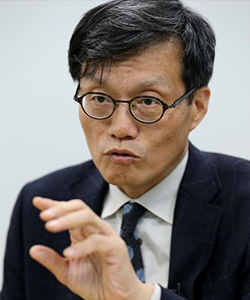 The IMF believes Korea needs tax revenue of mid 30 percent against the gross domestic product by 2050, more than 10 percent over current share of 24 percent, to finance surge in social welfare costs in aged society, he said. The government needs to start redesigning the public finance structure through incremental and overall increases in taxes, he said. Korea officially became an “aged” society with people aged 65 or higher taking up 14 percent of the total population and the working age thinning for the first time in 2017. 3Foreigners take profits after longest 14-day buying streak in Korean s..
4Hite Jinro turns to original design for retro look on its flagship soj..
5Korea has role regionally in ASEAN and bilaterally with Thailand: envo..